The woman that Sudan has unwisely chosen to take on in this case is Lubna Hussein, an outspoken journalist who has also worked for the UN, and who is not about to meekly accept a trouser penalty. In fact, according to the Times, she "marched into the court in Khartoum, Sudan's capital, wearing the same pair of loose-fitting green slacks that she was arrested in." 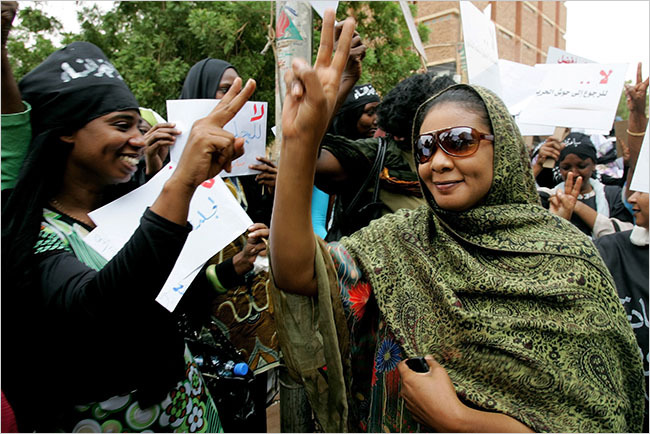 She has vowed to use the case to bring attention to the state of women's rights in Sudan, and she has had some success. The Times reported that diplomats from a number of Western countries – not including the U.S. – showed up at the courthouse Monday, "along with a throng of women protesters, many wearing pants." Several "bearded counterprotesters" were also present, shouting the sorts of things that bearded counterprotesters usually shout. After the trial, at which she was not allowed to testify, Ms. Hussein was fined, but she refused to pay. Told the alternative was a month in jail, she was unrepentant. "I would spend a month in jail," she told the judge. "It is a chance to explore the conditions in jail." She is currently exploring those conditions. Ms. Hussein was convicted of violating Article 152 of Sudan's penal code, which provides that anyone who publicly "commits an indecent act which violates public morality or wears indecent clothing" can be punished. The Times described this as "vague," and it is. It also implied that Article 152 is based on Muslim sharia law. It may be – Sudan is at least partly governed by religious law – but it is worth noting that there is a similar law on the books in (most likely) every single American state. And, as I have reported many times before, such laws (or similar city ordinances) have been routinely applied to American pants, at least when worn too low. In this country, interestingly, it generally seems to be young men, not women, who are targeted for low-pants violations. A spokesman for the Sudanese government said Article 152 was meant to "protect the people," although he did not explain why these people needed protection from pants or from women who wear them. He also claimed, inconsistently, that the law is not strictly enforced. "You come to Khartoum and you will see for yourself," he said, probably knowing that nobody is likely to take him up on that particular offer. "Many women, in offices and wedding ceremonies, wear trousers. Thousands of girls wear the trousers." He insisted that Ms. Hussein must have done something else illegal or else she would not have been prosecuted at all. Asked what her other crimes might have been, he said that was a "secret." Ms. Hussein has argued that Muslim law does not prohibit female trouser-wearing. "Islam does not say whether a woman can wear trousers or not," she said in an interview. "The clothes I was wearing when the police caught me — I pray in them. . . . If any Muslim in the world says Islamic law or sharia law flogs women for their clothes, let them show me what the Qur'an or Prophet Muhammed said on that issue. There is nothing. It is not about religion, it is about men treating women badly." She repeated this claim on Friday. "I am Muslim," she said. "I understand Muslim law. But I ask: What passage in the Koran says women can't wear pants?" While I am certainly no expert, I did look into this and haven't been able to find any references to "pants" or "trousers" in the Koran, and few references to clothing of any kind. The 24th Sura does mention "head-coverings" for women. It also requires them to "guard their private parts," which seems like good advice generally speaking, but it doesn't say how they must guard them. And since men are also specifically required to do this, but there is no separate provision for women as there is for head-coverings, this seems to suggest that women and men are equal in the sight of Allah in terms of their ability to use pants to guard themselves. Of course, anybody who would follow my advice on Islamic law probably deserves at least one lash just for that reason.